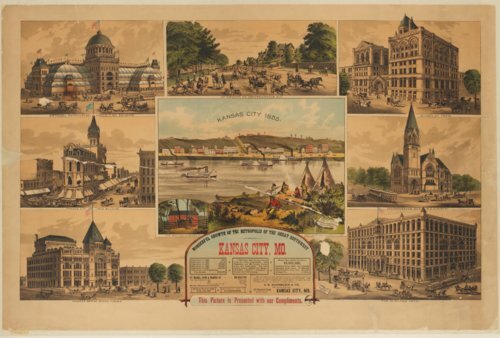 This colored lithograph depicts some of the major structures in Kansas City, Missouri. It is an advertising piece for J. H. Bauerlein & Company, real estate investors. The structures on the lithograph include the National Agricultural Exposition building, the Kansas City Times building, the Warder Grand Opera House, an afternoon on Independence Avenue, the Board of Trade, the Independence Avenue Methodist Episcopal Church, and the Midland hotel. The center of the image contains a depiction of Kansas City in 1855, that includes Native Americans and their tepees on the banks of the river as well as steamboats navigating the river. The box at the bottom center titled "Wonderful Growth of the Metropolis of the Great Southwest" contains numerous facts about the growth and prosperity of Kansas City, including a population of 200,000, the capitalization of local banks, and the variety of transportation that is available. The lithograph was pubished by Lanward Specialty Publishing Company, Chicago, Illinois.